The Drake (Dråk/Tråch), or Fire-drake (Fürdråk) of North German folklore is considered to be the same type of creature as a Kobold. They appear to the human eye as a fiery (red, or sometimes blue) streak passing through the air. 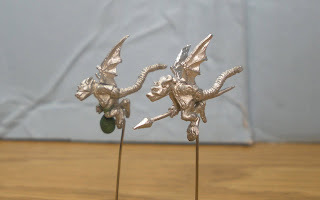 In my campaign, the Drake is a winged Kobold somewhat like the Urd from 2nd edition AD&D, or the Dragonwrought Kobolds from 3rd edition D&D in appearance. They have the ability to cast a glamour over themselves so as to appear as ghost-lights to anyone observing them, which is why they are described as fiery streaks of light. 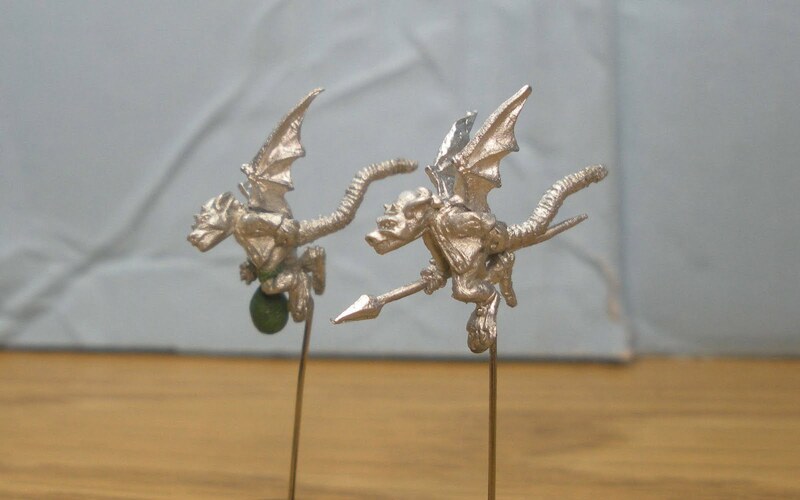 These two figures were converted from Ral Partha 15mm Battlesystem Kobolds. 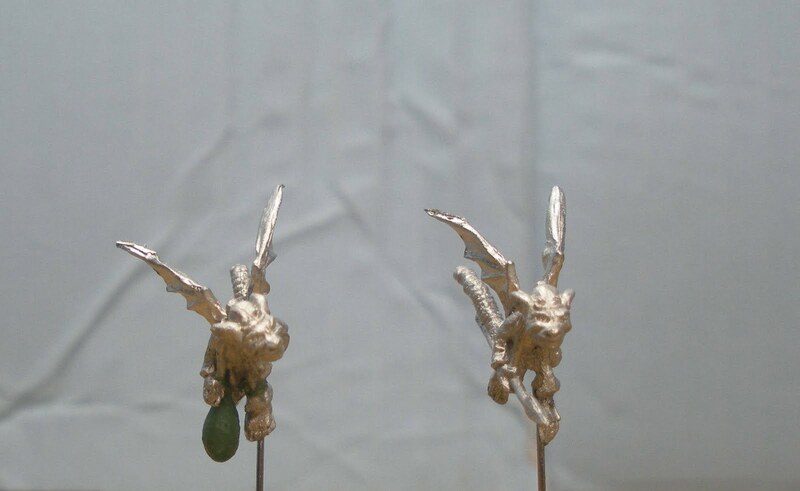 The bases were removed, the legs and tails were modified, and wings were added from some Reaper Miniatures bats (P03355B). Some additional modification was performed on the figure on the left. I bent his head slightly, and clipped off the spear he was carrying. A bag made from Kneadatite was added to his hand, because Drakes were commonly described as flying about carrying sacks of treasure or agricultural products. 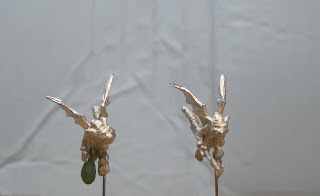 "The Drake carries treasures through the air. If a person sees him, he must cry: "Halb part!" He will then bring him something. But he must take care to stand under a roof, or the Drake will cover him with filth, which he will not again get rid of."